Get A Better Sign In Sheet! Check In Systems are a great way to improve customer service and reduce reception overhead. Our Check-In kiosks use an Apple iPad or a touch screen PC to replace the paper sign in sheet. Customers will sign in and directly notify a person or department without interrupting anyone. The sign-in process is fast, easy and your staff is notified instantly. This reduces your customer service response time, improving the customer experience. Your staff knows the person's name and exactly what they need even before they greet them. Touch Screens are the latest technology to improve Customer Service! You can replace the sign in sheet with an Apple iPad or touch PC for a low cost, efficient Check-In System. When your customer signs in, they instantly notify your staff without interrupting anyone. The information is automatically sorted, then presented on existing office computers. Your staff can then respond faster, having the needs of the person up front. Customer information is stored for long term statistics and reporting giving management valuable documentation as to workloads and trends. Apple iPads make great electronic sign-in sheets! The Apple iPad is a very stable and low maintenence touch screen that everyone is familiar with. Customers are familiar with the touch and feel of cell phones and tablets. This means they have no reservation about using it. 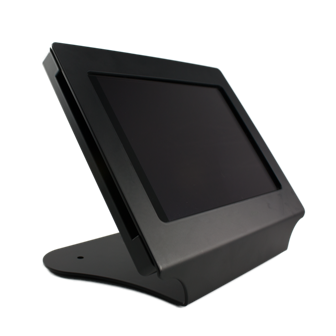 We frame it in a secure kiosk stand and it can be mounted on the wall, set on the counter top or used as a stand alone kiosk. IT staff will love the low maintenance and top security of the IOS platform. Since there is no data stored on the device, the security risk is at it's lowest. If it breaks, it is easy and cheap to replace compared to full blown PC based kiosk systems. 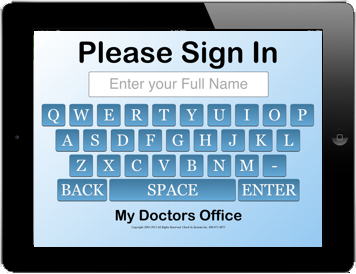 An electronic sign-in sheet saves all your data and gives you long term reporting abilities. After all, computers are supposed to make the job easier. With a database of names, dates and timestamps the kiosk can produce valuable reports about traffic flow, wait times, customer needs and staff performance. How would you like to know the average wait time or time to service a specific customer need? With a customer check-in system, its a simple report. Simple and Elegant, our counter top stand securely holds the Apple iPad Air to give a professional look and feel. The iPad is easily installed with 4 screws and a phillips screwdriver. The stand can be secured to a surface with screws or a Kensington cable lock. The Apple iPad is a familiar device to most people, providing a look and feel they are comfortable with. Young and old, everyone finds the check in system simple and fast.